I've started an account on Fan Fiction.net (user name Wolfbane-Chan) because I love to read fan-fics, but now, I'm thinking of creating my own fan-fic writings and random-fandomness, so heres my question: Would any of you check it out? Ever? Maybe? Wolfbane, whats the 'fan-fic' about? - Well, what ever I'm into It could be Tokyo Mew Mew, Digimon, Pokemon, Warrior Cats, etc. Okay, well leave a post and tell me what ya think! Also, what do you think about my little "chit-chat" writing style? Like, how I put what I think someone is thinking in the Indigo text, and I respond to the 'question'? Just tell me if you've posted any stories yet, okays? But then it wouldn't be SEN. The base of it is the original story of Digimon...the rest builds up from newer things we make. @Rabbit, YAY! Also, try looking up some fan-fics on the website Careful, of course, some aren't clean and some have gay pairings. I AM DETERMINED! ONE-SHOT! YES, I WILL WRITE A LOUSY ONE-SHOT! I AM WOMAN, HEAR ME ROAR! PUDDINGxTARUTO, WHO CAN SAY THIS COUPLE IS BAD? THEY'RE FRIGGIN' ADORABLE! Thoguh idk what it should be about... Err.. Naruto Maybe? I'm already working on action-figure parody of it called "The quest to find Zerobii, the none-tailed donut." Do you agree to the adorableness of Pudding and Taruto? 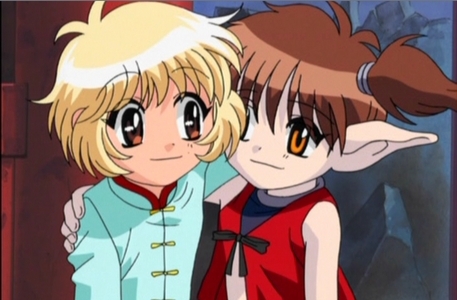 Even though I don't know anything about Tokyo Mew Mew, those pictures are adorable.